Subsistence farming or agriculture is a form of farming where farmers mainly focus on growing enough food to be self-sufficient. Especially in African countries, where people are very dependent of own-grown food, this type of farming is very common. Subsistence farming, however, in these countries has so much to gain and has so much potential. Improving the farming skills of the farmers could make significant contributions to the reduction of hunger. Unfortunately, farmers often haven’t had enough agricultural education to optimally grow their own food. To help these farmers, I developed an activity that will improve their farming skills. The application helps the farmers to identify diseases of their crops and animals and will present them ways to manage the diseases and prevent them in the future. Giving them an opportunity to manage diseases of their crops and livestock means giving them an opportunity to improve their harvest. The opportunity of a bigger harvest could be a substantial contribution to a better way of living for farmers in (a.o) West Africa. The activity is Sugar based and is therefore perfectly suitable for the XO-Laptops that are commonly used in West Africa. The activity revolves around a database with a lot of information about diseases of crops and livestock. When the farmer opens the activity, he will be led through two menus with possibilities. When the right crop or livestock is selected, a list with diseases will be shown containing identification possibilites for a particular diseases. When the farmer notices that one description of the disease is very similar to what is happening to his crops or livestock, he clicks on the disease. When the choice is made another window pops up showing the information the farmer needs to manage and prevent the disease. Right now it is only possible to access the database and read the information inside the database. What would improve the activity is a way where farmers can access the database and not only read, but also change and add information from the database. This way the information and thus the quality of the activity could be improved without any help from the outside. “Thursday, february 26th, we visited the University of Development Studies in Tamale. ICT researcher Francis Dittoh brought us there and we met up with some other ICT researchers, whom we would later interview on their work in ICT4D. They seemed to be aware of the development issues the local farmers are struggling with, but they are not actively working in this field. Two of the ICT researchers were quite enthusiastic and offered to volunteer for our project if we manage to complete the tool we are aiming to build. On Saturday we made a long road trip on the back of a motor cycle. We planned to visit the rural village ofGaliwei in order to interview farmers living in a remote and poor area. The village is the home of our host’s family. We were going to interview his father who is the butcher’s chief. On our way we really enjoyed the beautiful Ghanaian scenery; waving children, small towns and crocodile ponds, where people collect water and wash their clothes. When we left, our host was wearing a warm, neat jacket. He told us it was for protection in order to stay clean while driving. He asked us if we also wanted to wear a jacket. But it was so hot that we decided not to. However, 80 percent of the road consisted of loose red sand with large wholes on it. So, when we arrived, we looked like two red puppets, fully covered in red sand. In the village we were warmly welcomed by cheering and laughing children. We took some pictures and got rid of most of the mud, after which we entered the butcher chief’s hut. An old man dressed in traditional clothing was sitting on the ground. It was our host’s father, two older brother also accompanied the interview. Our host functioned as our translator. Every time one of us asked a question, it was followed by an intense discussion between the informants in their local language and later translated in English. After the interview we offered the butcher’s chief dutch cookies named stroopwafels. They broke the them into small bits and gave every child a bit. Before we went back, we needed to do some formal greetings to some more relatives of our host. It was already late in the afternoon when we arrived back home after another long ride on the motor cycle. Monday we left for our final destination: the Zaleriguvillage. 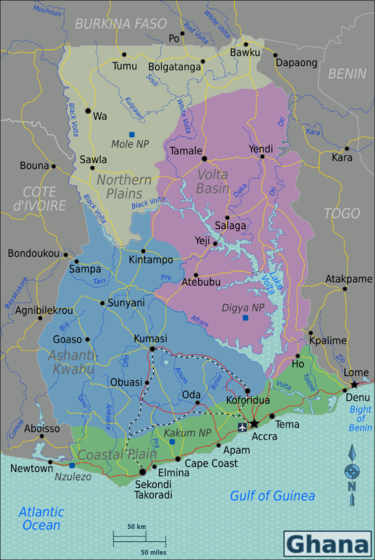 Situated near Bolgatanga in the upper north-east region. Professor Saa Dittoh picked us up and drove us there in two and a half hours. The village is his birth town and we were kindly invited at his family’s compound. Zalerigu can be considered as poor, remote and rural. A perfect village for our project, however, less perfect for personal convenience. We were warmly welcomed by Prof. Saa’s family. The family home is made of concrete and has no running water. However, electricity is available. So, we were very pleased to stay here.